Psychologists recognise our 20s as the most formative age of adulthood. What we do and don’t do in that decade shapes who we are for the rest of our lives. So a 20th birthday is a good moment to reflect. On how we got this far, and what the future might hold. What we’d like it to hold, in our wildest dreams. That’s why, as we celebrate the past 20 years of Refugee Week, we’re inviting you to look forward. What are your hopes and dreams for the next 20 years, or for the future in general? For yourself, for the rights of people on the move, for the UK, the planet or the world? Share your ideas in a video message, blog post, Tweet, drawing or however you like and share using the hashtag #SimpleActs (or send them to us by email). As Refugee Week enters its formative decade, there is much to celebrate and much to fight for. 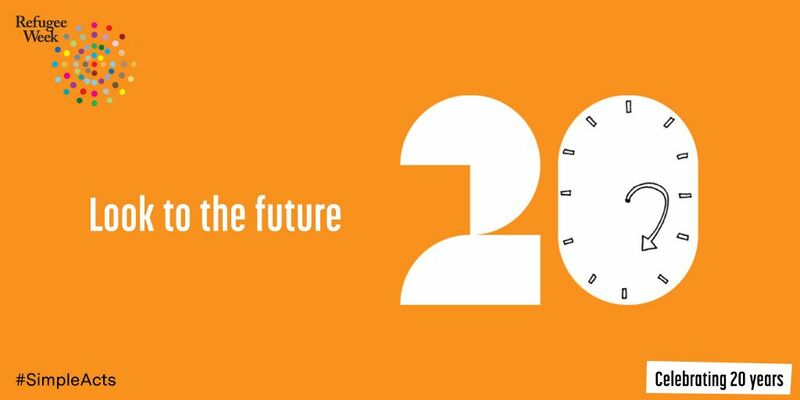 Help us imagine what the next twenty years might look like. There are 20 Simple Acts to celebrate 20 years of Refugee Week. For more information and the full list, visit the Simple Acts page.